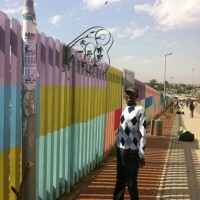 The Diepsloot Public Art Project, commissioned by the City of Johannesburg, progressed into its second phase with a 3-day community workshop in mid-February 2012 facilitated by the Diepsloot Arts and Culture Network (DACN), the Trinity Session and Jennifer van den Bussche and Genevieve Blanchett of Sticky Situations. 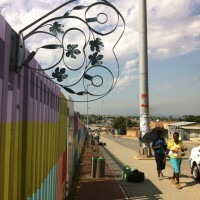 The workshop’s focus was to translate the street performance and creative works generated in the July 2011 Festival that could become construction blueprints for the final series of artworks, due to be installed outside Muzhomuhle Primary School in July 2012. 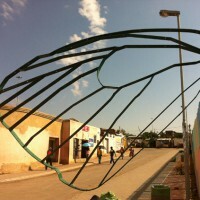 The Diepsloot community was inspired by the use of recycled materials in the costumes from last year’s performance (see I Love You, I Love You Not), and expressed keen interest in carrying this idea into the final artwork. 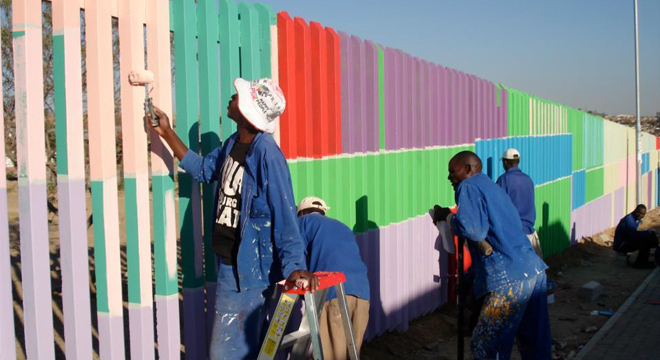 The challenge was out there – what ‘waste’ is available in Diepsloot, how could it be turned into something beautiful, and what extra functions could the artwork perform to serve community needs? 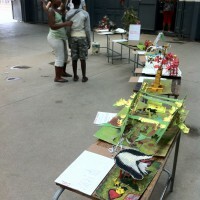 The participants of the February workshop, local artists and Muzhomuhle pupils, came up with a number of vivid and creative responses, all of which they presented to a large crowd of schoolchildren in the Muzhomuhle central hall. 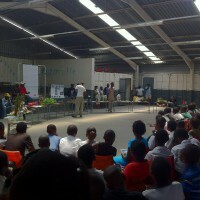 The audience responded enthusiastically and were able to vote for their favourite ideas. 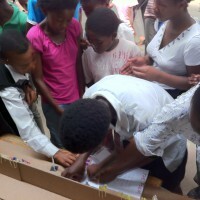 The project is now in the prototyping stage, with a small group of skilled workshop participants testing the best ideas, fabrication techniques and community responses.